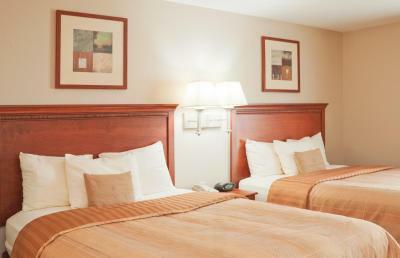 Lock in a great price for Candlewood Suites Eastchase Park – rated 8.3 by recent guests! The room that I booked didn't have 2 beds, so I had to get a different room with a higher rate. Rooms were comfortable and provided full size fridge, dishwasher and small cook top for long stays. Bed very comfortable. The front desk clerk was amazing. My child was with her softball team and we all stayed there parents included. Room was very clean and we had an amazing time. The staff were very helpful and professional. Bed was very comfortable. The location to my affair was excellent. The staff was very courteous. We loved the spacious room with all the amenities. Candlewood Suites Eastchase Park This rating is a reflection of how the property compares to the industry standard when it comes to price, facilities and services available. It's based on a self-evaluation by the property. Use this rating to help choose your stay! Featuring a fully-equipped kitchen and a seating area in each suite, Candlewood Suites Eastchase Park is only 1 mi from The Plaza at East Chase. Free public parking is featured on the property. 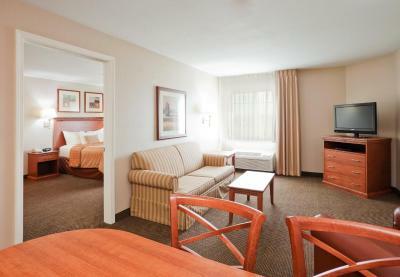 The air-conditioned suites include free WiFi access. A dishwasher and microwave are fitted in each kitchen. A flat-screen TV with cable channels is featured in the seating area. Auburn University at Montgomery is less than a 5-minute drive from Candlewood Suites Eastchase Park. This property also has one of the top-rated locations in Montgomery! Guests are happier about it compared to other properties in the area. When would you like to stay at Candlewood Suites Eastchase Park? This double room features a CD player, kitchenware and dishwasher. This double room has a tile/marble floor, flat-screen TV and microwave. House Rules Candlewood Suites Eastchase Park takes special requests – add in the next step! Candlewood Suites Eastchase Park accepts these cards and reserves the right to temporarily hold an amount prior to arrival. We were supposed to have a standard room with 2 beds which I showed the night manager on my confirmation when I arived with my family. He assured me there were no 2 bed rooms available and the notice he got did not say anything about 2 beds. They wanted to charge me full price for an addition room for my family so I asked for a refund and went to the hotel across the street that had a 2 bed room available. Will not be going back. The burners on the range did not work; there was no coffee pot in the room, and the TV remote kept giving me an error that the batteries were low and needed to be swapped out. Get what you expected or be notified of the change prior to checking in. Quite ,clean ,great towels and great bed !